Urgent Appeal of Parliamentarians across Asia and Europe !! Urgent Appeal of Parliamentarians across Asia and Europe for Mr. Sombath Somphone !! We, members of parliament across Asia and Europe, write to you deeply concerned about the safety and well-being of Mr. Sombath Somphone one of the most prominent Lao co-organizers of the Asia Europe People’s Forum 9, the founder and former Director of PADETC and one of the most respected and influential voices for sustainable people-centred and just economic and social development in Laos as well as in Asia. 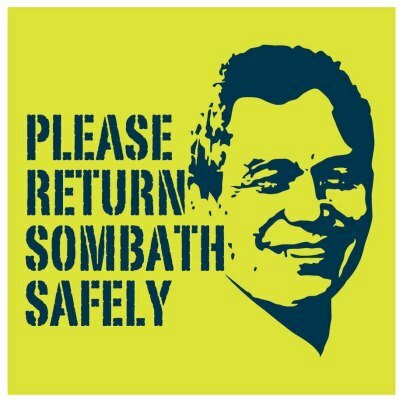 Mr. Sombath Somphone has been missing since about 5 PM on Saturday December 15th 2012. His wife and colleagues last saw Mr. Sombath Somphone on December 15 at 5 PM when he left the PADETC office in Vientiane to go home. He left the office in his own car; his wife was in another car. He did not reach home and his family has had no news from or about him since then. We are concerned about his safety, his state of health and his well-being. We are aware that the International Organising Committee of the Asia Europe People’s Forum has worked intensively with Mr. Sombath Somphone over the last year. His contribution to the successful Asia Europe People’s Forum 9 in Vientiane on the 16-19 October was extremely significant, widely recognized and deeply respected. In addition he is a highly respected educationalist, inspiration for sustainable development and a recipient of the prestigious international Magsaysay Award for Community Leadership in 2005. He has dedicated his life to sustainable development and poverty reduction in the Lao PDR, and has contributed positively to numerous international processes, including the AEPF9. Mr. Sombath is an inspiration to development practitioners all over the world. We are deeply concerned for Mr. Sombath’s safety and well-being and his disappearance is cause for great alarm. We urge the Lao Government to immediately and urgently initiate an investigation into Mr. Sombath’s disappearance. And, we call on the government to undertake all actions necessary to ensure his immediate safe return to his family.